Resolved the problem in a timely manner. 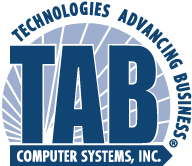 I loved the service from TAB - we depend on you now! Thank you! Clear communication between technician and myself. Helpful. While I was able to figure out the problem, I appreciated the quick callback. Jeff helped us right away with our problem. We are a tax office and had client waiting till our problem was resolved. He was great!!! James called regarding limited space remaining on my hard drive. He quickly and efficiently found items to be deleted and moved my archive to the server. I am grateful for the fast and friendly service. Peter is always pleasant and works to solve the issue. The response was timely and efficient. Was back up and running within minutes. Thank You. As a longtime client of TAB, we at LVSI appreciated everything your firm has done for our success. I can’t say enough about the professionalism and talent TAB has. James was able to quickly recognize that the credential pop-ups in Outlook were the result of a recent Office update that had been seen with other clients and roll our Outlook version back to a stable version. Perfect execution in reaction to our call for help. The only possible improvement I can think of would have been to anticipate the issue and contact us before it became a call for help - but I'm sure that TAB is working toward that goal already with the monitoring software. Overall great. Dan was great to work with on my last issue. Went above and beyond to help solve our issue. Excellent! Manchester Community College and its students is highly appreciative of your donation. Dennis was very easy to work with and very knowledgeable. Geoff at TAB responded with the highest priority and very quickly restored my lost folder which was critical to business activity today. Thanks!!!! The problem was caught and taken care of promptly. People are so easy to communicate with. they are serious but lighthearted at the same time. they are also cogitative of your time off the computer. Good peeps. "First time with restoring a file. Quick, easy, efficient. As always, Bryan does a great job! Sean was super helpful, and even came back to the office after he was done for correct a stupid mistake I made. Great as usual! The tech, Corey took the time to go to each desk in our office, to set up access to the conference room calendars. It may be a "little" thing, but it has made our office scheduling so much more efficient. James called me in a timely manner and found the files we were looking for in no time. James was great to work with!!! James is knowledgeable, professional and polite/friendly. The tech is fantastic! Always willing to help, answer any questions we may have and make sure we are satisfied before he leaves. Dan was funny and very helpful! So far, the issue has been resolved. Customer service is always on point. Our office is a tax office and our server went down while we all had clients in front of us. When I called I was put through to Jeff right away and he walked me through right away. Even though it took a couple of rounds, the problem appears to have been traced and fixed. Kudos. Always a great job and very efficient. got everything done in the time alotted. Great job as always!